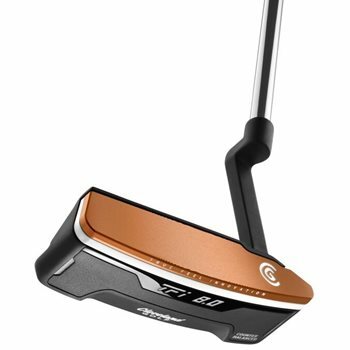 The Cleveland TFi 2135 8.0 putter is counterbalanced and features a new alignment technology that allows you to correctly align your putter no matter what your set up is. The alignment line has been raised to the exact radius of a golf ball, or 21.35 mm, to create the most accurate alignment feature for a blade putter. So whether you set up with your eyes behind, over or beyond the golf ball, the alignment line will always be in the center of the golf ball. The TFi 2135 also features True Feel Innovation, a new milled copper infused face insert on top of a copolymer insert for a soft feel and consistent speed across the face.